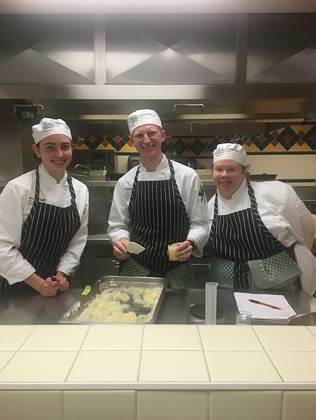 Home » Student Bloggers » Stories from the Lab: Culinary Science Makes Sorbet! Hi! I’m Majestic. Welcome to my blog at the CIA! I’m a culinary science student and I’m here to get you interested in—and possibly a little bit hungry for—our many lab exercises and experiments. 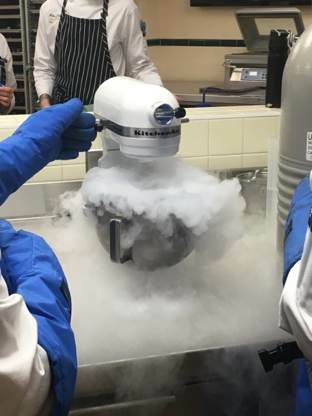 In our Culinary Chemistry lab, my classmates and I learned about how the different methods of freezing affect the crystallization of ice in sorbet. These differences can change the flavor, texture, and appearance of the sorbet. Making handmade sorbet is exciting. Did you know that there are tons of different ways to make sorbet beyond just adding it to an ice cream machine? Let me tell you about some of them! Our class had five different variations of sorbet-making methods. Teams 1 and 4 used liquid nitrogen (nitrogen in a liquid state at an extremely low temperature). Liquid nitrogen can range from -346°F to -320.44°F (-210°C to -195.8°C). I know what you’re thinking: Is this safe to eat? YES, it is! Nitrogen is nontoxic, odorless, and colorless. It is stored in insulated containers that are meant to prevent pressure buildup. Because the liquid nitrogen is very cold, protective gear is needed to prevent skin contact of the cold vapor. The sorbet mix was placed into the bowl of a Kitchen Aid stand mixer with the paddle attachment. The liquid nitrogen was then added slowly to the mixer on medium speed. Team 2 used the granita method. Granita originated in Sicily and, unlike traditional methods, it is spread into a layer and then frozen. It tends to be coarser and icier than other methods since it is broken up into pieces and scraped, like shaved ice. The sorbet mix was placed in a hotel pan and put into a blast chiller. It was then stirred every five minutes. Team 3 used the standard ice cream maker method. 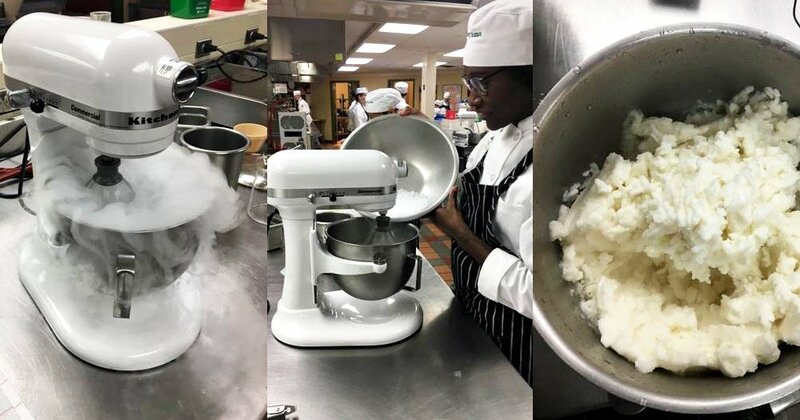 With this method, my classmates put the sorbet mix into the ice cream machine and waited until it turned the sorbet into the proper consistency. Team 5 used the dry ice method. This was my team’s variation! Dry ice is a solid form of carbon dioxide, which is known as CO2. Dry ice is colorless and nonflammable. It sublimates, or transitions from a solid to a liquid without passing through the liquid phase immediately, at -109.3°F (-78.5°C). Before doing this experiment, I wasn’t exactly sure what dry ice was used for. Dry ice can be used for many different purposes like shipping frozen food or to cool materials during production. Like liquid nitrogen, dry ice can burn your skin if held with bare hands. Protective equipment is recommended when handling. We placed the dry ice between two towels and smashed it with a mallet. We then added the dry ice to the sorbet mixture in a Kitchen Aid stand mixer with a whisk attachment, on medium speed (I had it on speed 4). No set amount was measured. I added as much as needed until the professor approved my sorbet to be at the proper consistency. Adding the dry ice to the sorbet mix shocked me. I was not prepared for the results. I saw the steam emitting from the mix and was truly fascinated—I’ve never seen anything like it up close. I couldn’t stop smiling! Team 6 used the ULT freezer method. ULT stands for ultra low temperature. These freezers can be as cold as -112°F (-80°C). The sorbet mix was added to a hotel pan and stirred every five minutes. Each sorbet variation took different times to form to the proper consistency. Team 6 (ULT freezer) took the longest with 60 minutes. Team 2 (granita) was next at 40 minutes. My team, Team 5 (dry ice), took the third longest with 16 minutes. Team 3 (Ice Cream Maker) was fourth at 7 minutes, 49 seconds. Team 1 had the second shortest time with 2 minutes, 54 seconds. And finally, Team 4 was the shortest at just 2 minutes, 30 seconds. I was also shocked to find out that even though the same main ingredients were used to make the sorbet for all the teams, the method variations completely changed the flavor and texture of each. None were the same! I personally liked my team’s variation the most. It somewhat resembled cottage cheese with its chunkiness. It was also one of the firmest. While teams 1 and 4 both had the liquid nitrogen variation, the results were not the same. Team 4 had a human error component, which skewed the results. Team 1’s sorbet was firm but smooth and had very small ice crystals. Team 2’s sorbet was also slushy. It tasted a lot like—and resembled—applesauce! My classmates decided that the ice cream machine method yielded the best results, producing a smooth and airy sorbet. The ULT freezer method had the most undesired results. The texture was extremely mushy. My classmates nicknamed it “wet snowman” since it resembled melting snow. This was one of my favorite labs to date. It was such an efficient and FUN way to demonstrate that cooking techniques and methods have impacts on appearance, flavor, and texture. The texture of the sorbet depends on the size of the crystals. The longer the freeze time, the larger the crystals. Try the experiment yourself—I bet you’ll be just as shocked as me. Can’t wait to share more stories from the lab with you soon!